Bellator 214: Fedor vs. Bader is set to take place tomorrow night (Sat., Jan. 26, 2019) at The Forum in Inglewood, Calif. 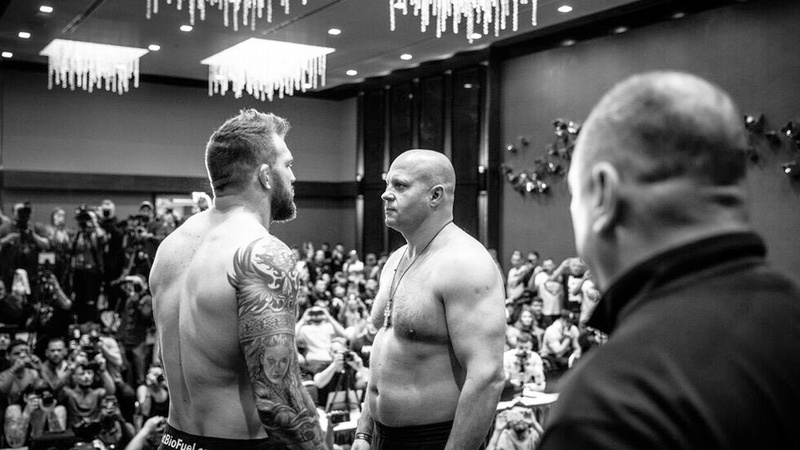 The main event features a big fight with current light heavyweight champ Ryan Bader will square off against Russian MMA legend Fedor and the former PRIDE heavyweight kingpin Emelianenko in the finals of the Bellator heavyweight Grand Prix tournament. If Bader wins, he’ll become Bellator’s first ever two-division champion simultaneously. ‘The Last Emperor’ is currently riding on a two-fight winning streak, who got into finals with a pair of first-round knockout wins over former UFC stars Frank Mir and Chael Sonnen. Bader advances to the finals after picking a knockout win over Muhammad Lawal back in May followed by a decision win over Matt Mitrione at Bellator 207 last October. Moreover, in the co-main event, a rising star Aaron Pico will face veteran Henry Corrales. After suffering a setback in his pro debut at Bellator 200, Pico picked up four straight victories afterward. Also, a former WWE Superstar Jake Hager (Jack Swagger) is making his professional MMA debut against J.W. Kiser in a heavyweight bout. Another exciting fight where Juan Archuleta will squares off against Ricky Bandejas in a bantamweight bout. The prelims start at 7 pm ET/ 4 pm PT and the main card begins at 9 pm ET/ 6 pm PT. It’ll broadcast on Paramount Network. You can also stream the event on DAZN. Fight fans in the USA can sign up a 30 days free trial to watch the event online with DAZN, a live streaming services who agreed to a multi-year deal with the promotion back in June. Bellator 214 will be shown in the UK on 5Spike this Sunday at 10:55pm UK time. Weber Almeida def. Odan Chinchilla via TKO (head kick and punches) at 3:04 of round 1. Art Rivas def. Sean Johnson via TKO (knees and punches) at 4:30 of round 1. Ryan Lilley def. James Barnes via head kick KO at 1:03 of round 1.